The subject of time has always interested me, of course we all take it for granted, set our computers, phones, and clocks, and run our lives by its relentless force. Saint Augustine in book 11, of the Confessions, contemplated this problem about past, present, and future, with questions like: Where exactly is tomorrow? Or for that matter where is the exact location of yesterday? Time doesn’t seem to be a material thing, although it surely acts upon on all things material. The great philosopher Immanuel Kant thought time a mental construct, the minds way of organizing our experience. Einstein saw time in geometric terms as another dimension in a curved space-time continuum. Contemplating the “present moment” is even more difficult. Being a photographer, I see every photograph as a slice of time, a frozen moment, captured by shutter and light acting on the light gathering pixels in the camera. Recently, I have been experimenting with high-speed strobe equipment to capture very thin slices of time to see things that our unaided eyes are not able to see. The idea of catching a bullet in flight seemed like a worthy challenge technically and aesthetically. 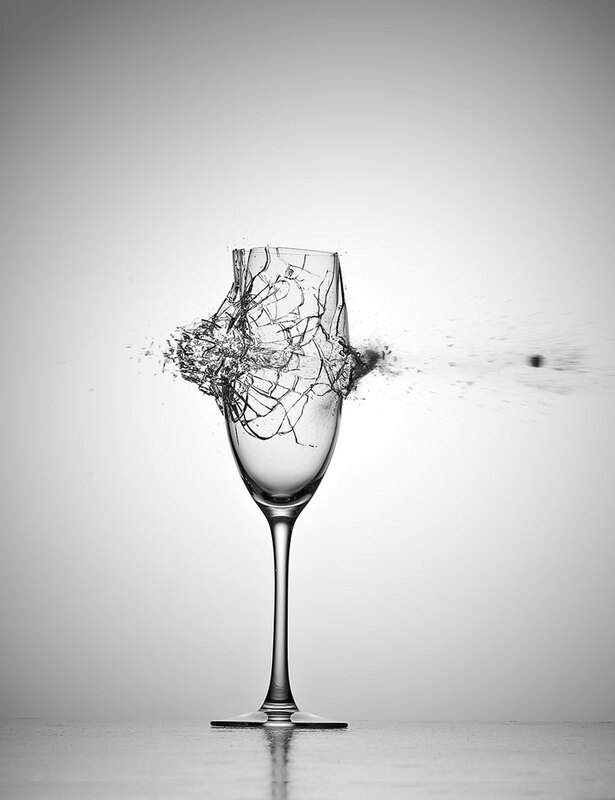 My idea was to photograph a bullet going through a wine glass in a visually compelling way. The first item was to figure out exactly how to do this, that is, catching the bullet at just the right time. Fortunately, I had some numbers to help me. The pistol was a .20 caliber air gun with a muzzle velocity of 400 feet per second. I used a Ubertronix sound triggering system to fire the high speed strobes, and knew that sound at sea level travels about 1,100 feet per second. To make the math easy I fixed the distance of the muzzle end to the glass at one foot. My calculation predicted if I placed the sound sensor perpendicular to the muzzle end at a distance of 3 feet, the bullet would be within the two-inch width of the glass. Doing the math right is very important, but after that, it became an empirical affair. I spent a couple of days in a darkened studio; setting the camera on a 10 second delay, hitting the shutter, going over to the set up, firing the gun, tweaking the variables, until I could consistently see the bullet within the two-inch margin I needed to actually hit the glass. I was confident enough by then to go out shopping for different wine glasses, and called my colleague Bob Beard to help out on the third day. As you can imagine, we broke a lot of glasses. I had a specific idea of how I wanted it to look, and towards the end of the third day, in the midst of a lot of broken glass, I thought we had something interesting. I like the austere black and white look of the image, and you can see some interesting physics going on, particularly Newton’s third law of motion in the action/reaction energy of the initial impact blowing backwards towards the gun. It was an exciting day, even with all the clean up we had to do. So that’s the story as best I can tell it. I hope you all enjoy the image as much as we enjoyed creating it.